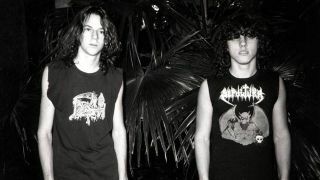 Death are reissuing their game-changing debut album Scream Bloody Gore with Relapse Records and they’ve included two extra CDs worth of Deathy goodness for y’all! If it wasn’t for this record, death metal probably wouldn’t sound as gnarled as we know it today. The remastered version of the album also comes with tons of rehearsal footage from 1986 and a special session from Florida. The reissue will be available from May 20 in 2CD, 3LP, deluxe 2LP box set, cassette and digital formats.